Emma: David, thank you for taking time out of your hectic schedule for us today. David: Thank you, Emma. It's a pleasure and an honor to talk to you. Emma: I was wondering if you could tell us a little bit about your works? David: Well, I think my works could be roughly divided into two categories. One is a series of symbolic works, like this small piece here, called Memento. I suppose it is pretty easy to make some sense out of it if you look at it closely enough. 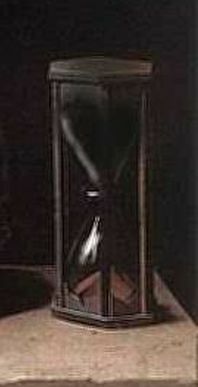 Emma: Let’s see, at first sight, it just looks like an ordinary hourglass, except the upper section is painted all black, so you can’t see the sand inside. Does this mean ... you never know how much time you have left? David: Exactly. It reminds you that, no matter how young you are now, you don’t have the slightest idea how many more years you have to live. That’s exactly what it’s all about. An hourglass is a traditional memento mori in European art, but I gave it a little twist. Simple, isn’t it? Emma: Yeah, I guess so, with the help of the title, Memento. Somehow I feel this image is far scarier than other more obvious symbols of death, such as a skull. David: Right. Interestingly, subtle symbols are sometimes more effective, because they make you think. You have to figure them out yourself, and you won’t forget the answers you’ve found for yourself. Emma: You mentioned two categories. What is the other? David: Well, you could call it surrealistic. The Landscape series is in this category. Emma: Is there a common theme to the Landscape series? David: No, I wouldn’t say I work to a fixed theme all the time. When I’m working on a symbolic painting, I usually have a specific title in mind, and I feel I’m in complete control of myself and the effect of the imagery I’m creating, but when I’m painting a surrealistic tableau, I often don’t know myself what objects I might want to throw in, or why I might want to do so. The whole process is more or less spontaneous, automatic, so it’s unpredictable. The title is always the last thing I come up with. Sometimes I’m at a loss what to call the end product. That’s why I often give up trying to think of an appropriate title and end up just calling it “Landscape 15”, for example. Emma: So you aren’t sure yourself what your surrealistic paintings are all about? David: No. Not in most cases. I really don't want to know why I paint particular objects. Too much analysis can kill creativity. The sense of mystery is an essential element in this kind of painting. Emma: Lastly, what do you think it takes to be a good surrealist painter? David: To be a surrealist painter of the kind I admire, like Dali, Magritte, or Giger, you have to be a superb realist first. It might sound like a paradox, but it isn’t really. 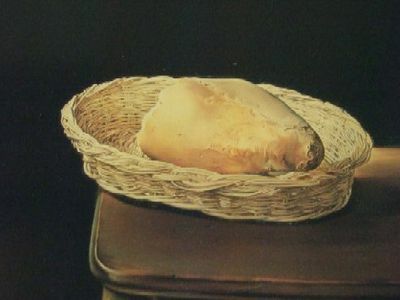 Remember that Dali painted an exquisitely realistic work he titled The Basket of Bread when he was young. Surrealism is not anti-realism. Surrealists don’t try to deny or destroy reality. They try to create another reality, another world. No matter how crazy or weird it looks, it’s O.K. as long as it’s visually convincing. In order to make your world look convincing, you have to have the basic skills to paint realistically. If you don’t, it might be pretty hard for you to be a surrealist no matter how wild your imagination is. Maybe you should try to be something else, say, an abstractionist or expressionist. ＊This interview is fictional. The painter doesn't exist.